OK, we’re all older now and I want to do a display of your young, gifted, black descendants. They’ve been hearing about DuBois and what we did. Now let’s give them the opportunity to be the focus. Recent newspaper articles in the Roanoke Tribune about young gifted black students sparked this interest. FYI, this black-owned newspaper owner is from the Rotan family in the Fayetteville area. I read some time ago that a Mr. Rotan started the first school for black children in his house in Cotton Hill in the 1800s. According to the DuBois Echo, the last DuBois Rotan graduate was William Rotan, a 1955 graduate. The Roanoke Tribune editor is Mrs. Claudia Whitworth. She worked with her father for years in this business. I met her a few years ago when she was in Fayetteville on business. The sign on her car read “Making and recording black history since 1939” and I waited for her to come to the car. We chatted and she drove me and her daughter who was accompanying her to the Tank Hill area where she was looking for her grandfather’s gravesite. It was Feb…snow…we found it! (I was scared walking in that cemetery in the snow…she bounded along so I sucked it up and tried to keep up)! She’s now in her mid 90’s, still drives and is still the boss! Fascinating woman! Her son and daughter, along with others work in the business. So, send articles, pictures and printed information about your descendants for this project. Please send copies I can laminate and use for display purpose. Only send what I can keep. Check with relatives. Ask around. You may be surprised to learn what someone has done. 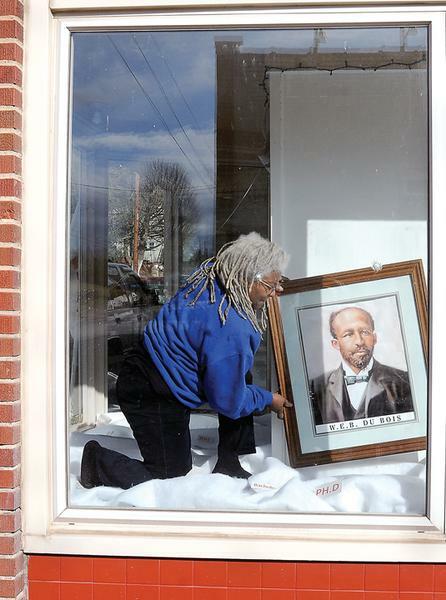 DuBois was known for its very good education under difficult circumstances. Let’s share what those descendants have done and are doing. OK…maybe they aren’t “kids” anymore. Maybe you’re grandparents by now. Share your accomplishments and those of descendants. I just think it is so important to let us and others see positive things about us. Let’s acknowledge and support the talent/education. I would like to do this display in May. Send the information to DuBois on Main, 116 Main St. Mt. Hope, WV 25880. One of the benefits of living in this small little area is the mailman and UPS man know me. The regular mailman will leave mail at the house if the museum is closed and UPS will leave packages where they are safe. I live nearby, so it’s convenient. Watch out for our news about the new scholarship program. Yes. We have two $500 scholarships to be awarded this year. W.E.B and Booker T. scholarships. Hopefully, one will be attending a technical school and the other a 4-year college. A supporter donated the funds. Applicants have until April 1 to postmark their applications… So, we’ll have results announced in May. Please pass this information along to anyone you think may have attended DuBois High School in Mt. Hope, WV or is a descendant of someone who did. Thanks very much. Be safe and enjoy life. Laugh a lot. It’s healthy. Find the humor in whatever situation exists!